The Royal Welch Fusiliers were granted the Freedom of Wrexham. On the wettest day of a very wet summer the Regiment was granted the Freedom of the Borough of Wrexham. Major General G. F. Watson CB, DSO, OBE represented the Colonel of The Regiment General Maitland Wilson C.B. D.S.O, O.B.E who was indisposed. Troops taking part in the ceremony were a mixed band of R.W.F. 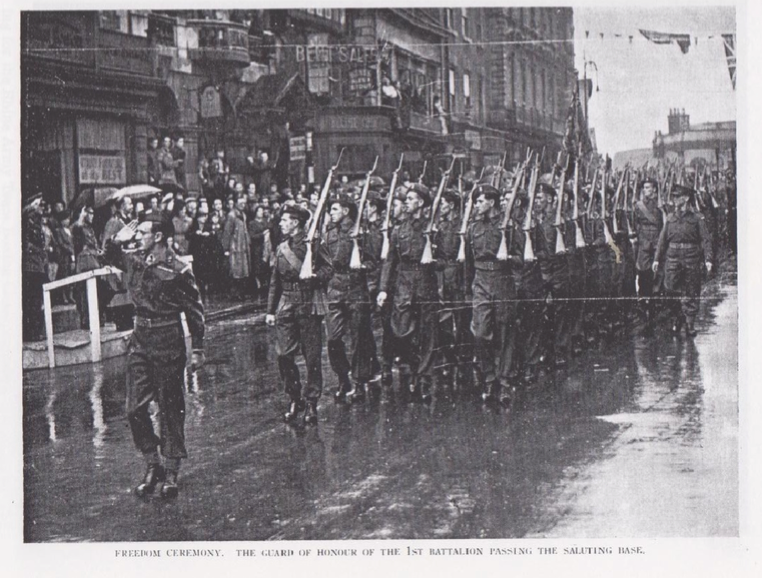 and South Wales Borderers, a Guard of Honour of the 1st Batlalion under Captain Glyn Evans, detachments representing every Battalion which served during the war, including the Home Guard and Cadets, and a body of old Comrades, conspicuous amongst whom was Pensioner Scattergood. from the Royal Hospital, Chelsea. Lieutenant Colonel Gwydyr Jones, D.S.O. O,B.E,, commanded the parade.